There's an old adage that teams need veteran experience in order to create a winning atmosphere. Bringing in players that have already won championships will get a team through tough times and show them how to keep pushing it until they're the only team left on the field. You can imagine my disappointment then when I realized that the Jays don't have a single player right now who has won a world series. The Jays are a young team but I figured there might still be a token reliever with a ring to his name. But no, not one. So I decided to look into how real this old nugget of wisdom is. 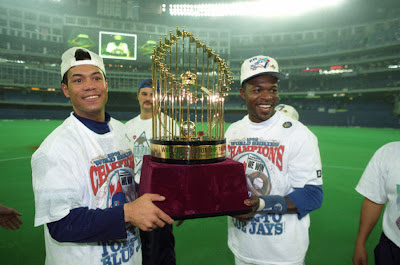 I looked through all pennant winning teams dating back to the strike and determined how many players each team had that had already won a ring. I excluded teams that had won the World Series in the decade prior since those teams were likely to have many of their own players left that were on the previous winning team. The players left on this list were therefore generally obtained by trade or free agency since any homegrown player would not have had a chance to play for a ring. The table below shows all these players as well as the stats they earned that season for the pennant winning team and their corresponding rWAR. Well it's bad news for the Blue Jays looking at this list. Every team that won the World Series had at least 1 player with a ring, and the 2011 Rangers were the only team at all to have no players. Maybe the start of a new trend? But how important were these players really? There are 71 players on this list divided among 22 teams. Out of those I count only about 45 players who played (or were intended to play) significant time for their team. In fact the 71 players combined for only 101.3 WAR, an average of 1.4 per person. That's substitute level production. 16 of the players had negative WAR. Only 22 players had a WAR greater than or equal to 2. Only 6 players had a WAR above 4 and all of them were starting pitchers. It's a pretty unimpressive list. The 1996 Yankees got the most help from these players, 14.6 WAR spread among 7 players. I'd argue the 2005 Astros got the most significant contribution from the listed players with 14.1 WAR coming from ex-Yankees Pettitte and Clemens. So it really doesn't seem as if having players who have previously won contributes much to a team. Maybe there's more to the locker room effect than I'm putting stock into, but since it can't be quantified I'm only going to focus on on-field results. Judging from the quality of players on this list I'd conclude that the teams won pennants much more because of the other talent on their roster than the ring-winners they picked up from other teams. It shouldn't be a big surprise though that this list is filled with unimpressive seasons. Teams tend to make sure that key contributors on their championship teams stay on the team for as long as possible. Minor players aren't retained and end up being minor players on other teams. A lot of these players also were very close to the end of their careers. The 2005 Indians didn't have a lot of competition in signing 44 year old Dave Winfield. So instead of worrying about bringing in players with championship experience, teams should concern themselves with bringing in talented players, it means a lot more. But if Anthopoulos is worried about not seeing any World Series winners on this list who didn't have at least one previous winner on it, I hear Arthur Rhodes is still looking for a job. He fits the profile of this list pretty well.